This DP500 II follow focus is improved based on the previous DP500 version I follow focus.It is consisting of a improved dampened gearbox,which promise no backlash or less backlash(<0.5mm).There is a button downside can adjust the tension of of the gearbox to reach 2 dampen level. 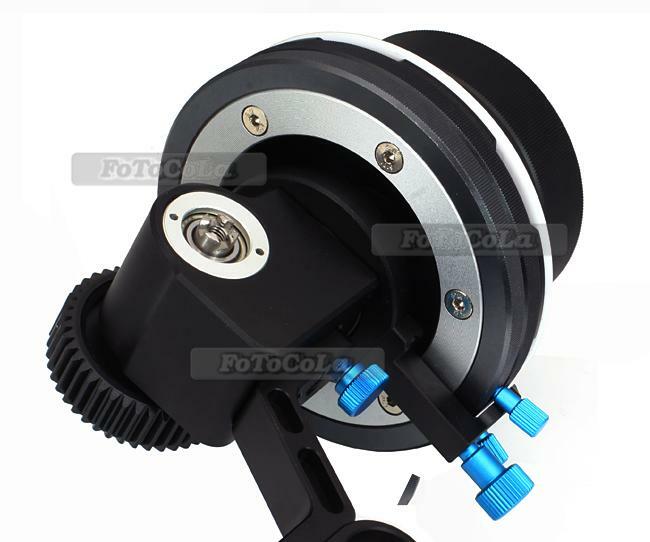 Gear wheel on it can be detached and insalled in other side,which makes it suitable for both left-hand and right-hand photographer. The white mark ring is made of magnet material.It can be detached or attached very easliy and quickly on matel-made follow focus.You can also buy additional mark ring. Improved design has dampening which gives virtually zero backlash(<0.5mm). 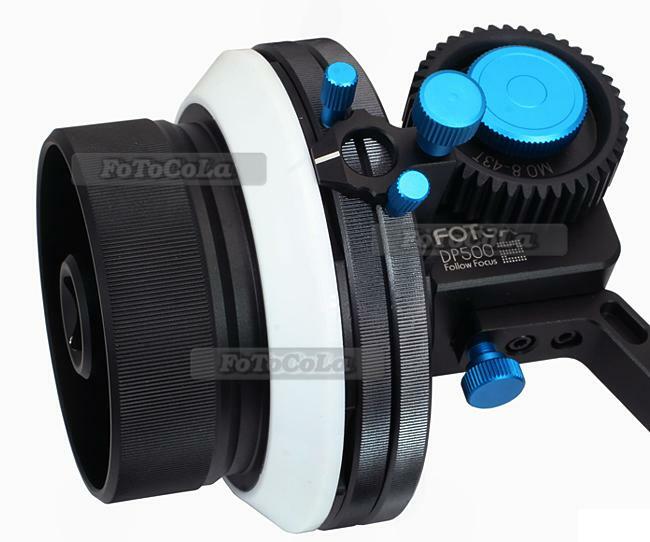 Compatible with industry standard Follow Focus Whip or Crank. Ouch, that a progress within just one year. Thanks, really looks like huge improvement over old one. I really like my original DP500 but I need dual sided gears, like this one. The only real complaint I had on the first version was that the marking ring doesn't erase very well when you use whiteboard markers. I wonder if they fixed that in this version? I wonder if they fixed that in this version? You can ask them :-) I hope that they fixed it. @svart I just ordered one. I'll let you know if they've fixed it. Looks like very high build quality for the $$$. This may be my next FF, D|Focus v2 is disappointing. Non China manufacturers now compete only in studio FF range. Full studio grade FF with double sides are still rare, only Tilta makes one as I know. I had my eye on the D|focus but plastic for the price turned me off. This one looks pretty solid. Nice to see some reasonable priced FF. @RatLabProductions I was so impressed with the build on the Fotga rails I wanted to try the FF too. It looks like it's built just as well. it is "under development" for long, long time. @Vitaliy_Kiselev: Good to know. How much is the Tilta one? How much is the Tilta one? Have no idea, need to ask. I just received my Fotga DP500 MkII follow focus unit today. Extremely happy. All aluminum or steel other than the gears. The gearbox tension adjustment works well, loosened off all the way the focus wheel turns very easily with just a bit of backlash (< 1mm) but tighten it up a bit and the wheel becomes very fluid feeling and the backlash virtually disappears. One feature I really like is that the marking ring index pointer/hard stop can be moved to where you want, not locked at the top of the marker disk. If you are shooting alone with the camera on your shoulder or at head-height, you can rotate the index pointer 90deg to the back of the unit, in line with your eyes. Shooting below waist level, rotate it to the top, always in plain sight. Also has a magnetic marker disk that is cheap and easy to replace. Ordered mine with the optional quick release rod clamp, still very solid but much faster to install and remove when you have a mattebox or other items on your rig that you can't easily slide off. All in all, seems like extremely good value vs Lanparte and Tilta at half the price. One note that I assume is not only for this unit. The gear is relatively small and when using the large diameter lenses the hard stops interfere with full close to infinity focus travel. On my Canon FD 35-105 zoom it come within about 2 degrees of full travel. Not that this is a big issue but I am going to ask if they offer any larger gears. Otherwise would need to remove stops which always presents problem of losing them. another thank you! please keep us updated if there are larger gears available or not. Damn, I just bought their original follow focus a month ago. Anyone wanna swap? I have also got the new Fotga DP500 II, first impressions are good. Well built, strong and a professional feel to it. Will use it on a film shoot all this weekend and see how it performs. Will write more about it after the shoot. I bought a 50-Dollar Follow Focus from the Kickstarter campaign, and while it's great for one-person operation (you can remember focus points based on the handle angle and pull focus while your eye is glued to the finder/monitor) the lack of hard stops on lenses with friction-couple focus rings that have no hard stops on their own makes the Fotga with hard stops quite tempting, especially given the price. Hi Passman, I'm very interested in your experience with this follow focus. I am after a follow focus with hard stops and adjustable pointer because i place my follow focus upside down. This is the best value but i'm worried it will fall apart. The only other options are the Tilta follow focus which is very hard to find and the new redrock micro which is $800! Just ordered a Fotga DP500 II. If it's anything like the quality of the Fotga baseplate, it'll be a solid piece of professional equipment. Will post my thoughts once it arrives. So, i've been using the Fotga DP500 II now for 3 full days of hard shooting and it has performed almost flawlessly. I did notice some backlash after 1 day of use but nothing major. The dampening adjustment helps to reduce the backlash but it makes the focus wheel a little heavier to turn. The gear and gearbox works well, but would be good to have a little bigger gear to utilize the whole focus range of large diameter lenses. Included with the FF is one gear belt made of soft rubber, the quality is ok but feels a bit flimsy. I would recommend to buy gear belts from elsewhere. I have a set of zip tie gear belts from half inch rails that work well and feel very solid for my lenses and this unit. The 2 hard stops are very useful but i had to tighten them very hard to keep them from moving, but not a big problem. Index pointer is very solid and doesn't need to be tightened so hard for it to stay put, also a great feature that it can be put in what position you want. Very helpful in many situations. Removable marking disk is great, the magnets are solid and easy to take off. I use a whiteboard marker and the disk cleans off easily with a plain cloth. I bought this follow focus because i had a little extra budget money left for a job that i would do and decided it would be fun to try one of these units. I didn't expect it to last a long time considering that i only paid 155 dollars for it. It has some small issues and details that could be improved on but it does the job that a follow focus should do. Overall it exceeded my expectations and at this price point it's a steal. I wouldn't rely on it to last a lifetime, but it's a good alternative to those who can't afford the more expensive FF's.